For several years I've been using Mabel's Labels for all three boys to label their gear. They are so durable - they last through numerous washings and tough play. It sounds crazy, but I've found that their clothes fall apart long before these labels do! Pierce, Cort and Reid have their labels on things like backpacks, lunch boxes, water bottles, towels and jackets. This summer, Mabel's Labels has a new day camp set and offered to send me one to review. I ordered a set for Cort. 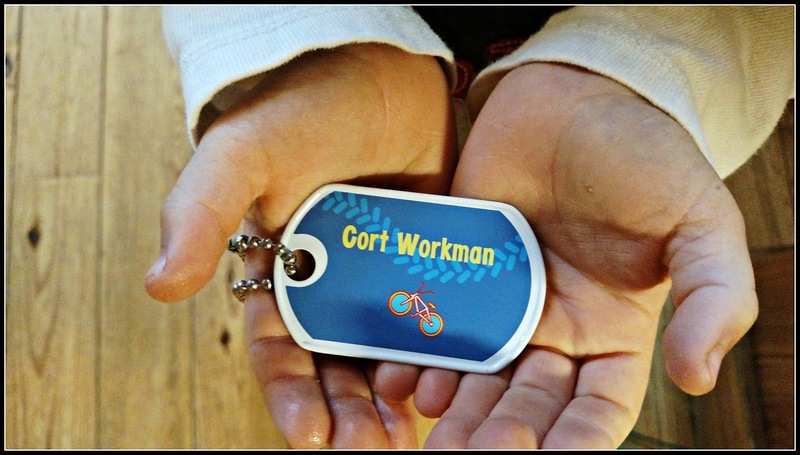 You can personalize the labels with fun pictures unique to your child - Cort loves to ride his 'trick' bike so I picked a bike for his labels. In addition to receiving the two metal tags which are perfect for swim bags or backpacks, he also got an assortment of different sized labels. One thing I love is that they have rounded edges, so even if you stick them on a tag in a shirt, they aren't prickly or itchy. Disclaimer: I received a pack of Mabel's Labels for review purposes. The opinions above are my own. I don't like giving out my email but those labels look really good and I may contact and just buy them directly for my granddaughters. Nice to have, we used a marker. My stepbrother had my initials upside down so always argued. These are nice looking, and I like how they can be personalized. They are a far cry from the black markers we used. Or the thread--my mom sewed a bit of red thread on the edge of my towels I took away to college. I still have some of them. These are extra nice. I like the shape, and also that they are so big. handy gadgets. wish they had been around when the kids were little. I like that the labels are dishwasher and microwave safe and waterproof. kristiedonelson(at)gmail(dot)com Thank you. Do they just stick on?? On fabric?? Hmmm....if so..that would be wonderful. those labels certainly look handy to have. Those labels are sooo cool! I love how many different labels they have and that they are wash proof, kid proof and all around stick to anything and everything labels!! I think it's awesome that they have customizable allergy alert labels. These would be a great gift for my nephew! Hope you are doing great. We just got home from a fantastic vacation at the beach. Love these labels. I have to put labels on all my mom's stuff in the nursing home. Bet she would like something pretty. I like their personalized bag tags. I think I like the rocket ship the most. I like how they can be personalized. I really like the Custom Shoe Labels, but they all sound great. Your review was very helpful. I like their Big Kaboodle™ Label Pack. I like the Iron On Clothing Labels!